Hey all. It has been a few days since I posted that I was needed a little more time with the DNA podcast. I always feel obligated to post the podcast as the next post right after the preview one, and then when life gets in the way, don’t think to keep posting other things to keep in touch with all of you. I’m in the process of still sorting things out and I am not sure how much you want to hear about the reason for the delay, but I am sure I will mention it (at least once if not a ton) in my podcast when it gets recorded. I know a lot of people would have wondered why I haven’t recorded. I do have a full-time job and am spending time solving my problem, one thing every day. There is no happy time to update or record. I’ve been really frustrated (at myself and the situation) and I have made myself ‘overly anxious’ (worried – A LOT) about solving this problem, so I have no energy. Nothing really like the feeling of adrenaline when you’re stressed to give you the energy you need, but then there is nothing like the crash when said adrenaline leaves the body. Hopefully things are looking up from friday afternoon on. If I do happen to mention the cause of my delay on the podcast and you say “That’s all?” or “Why are you getting so worked up?”, please don’t tell me that – I already know this. It’s what I do. Nothing rational or scientific about it. Just worry. Even though it doesn’t solve anything and tends to make me physically ill. 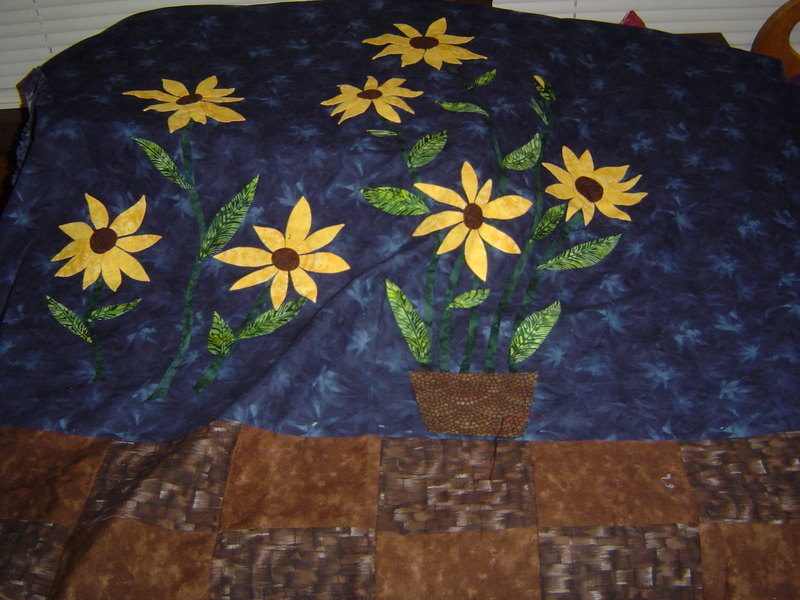 I did get the flowers and leaves sewn down on my wall hanging. I made a bottom floor of alternating browns for my flowerpots to sit on. Before the flowerpots get stitched on I think I may need at least one more leaf on the left side. I have been asked if I was going to do any different flowers, and the answer to that is ‘no i don’t think so’. I do have a wildflower applique pattern that I bought a while ago that has just been sitting on my shelf, but I even with that resource I still like the continuity of the same flowers in the pots. I suppose I could have bought a complimentary orange-colored fabric or used different shades of yellow to create more interest in the flowers. If I do use the butterflies though I do have a lot of color options. We shall see. That’s the wonderful thing about this quilting thing. You have the time to figure things out if you need it. At least if you have taken since September to work on this piece, you don’t feel like it needs to be done tomorrow or anything. No stress. Unlike my situation. Which makes this fun to work on right now. I like your project just as it is. Sometimes simpler is better. If you decide you want to do different flowers or add a bird or a butterfly or whatever, just make another one and add/change these elements on it. Then you will have a “series” of quilts. Thanks for that confidence I keep imagining a splash of another color somewhere on the quilt after the bird comment was made. 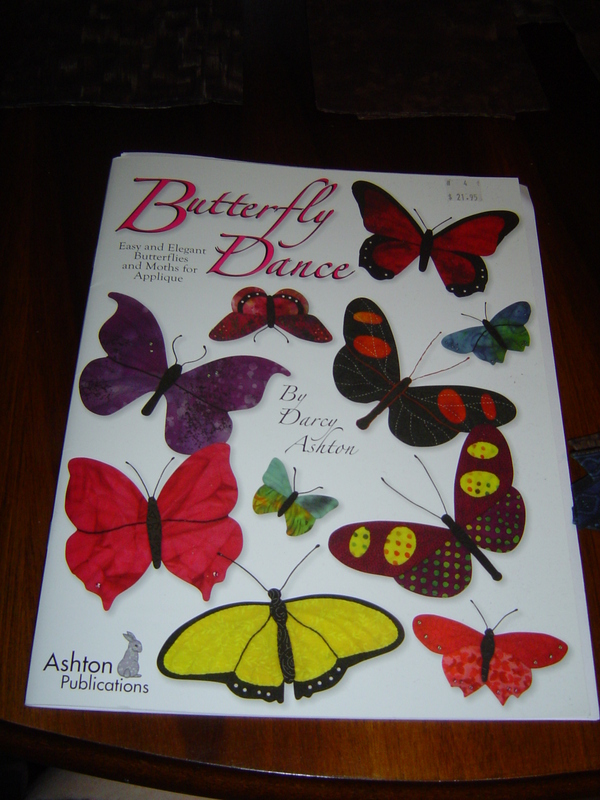 Or I could make a ball on the ground or do a single butterfly. I do like the simpleness of this piece, but I am at the point where if I don’t add (one thing) to it I may regret not doing it. And since this has taken me a LONG time already, I doubt I’m making a new one. I’ll look through my patterns and see what works. But no more flowers, you’re right about that. Hey Darla – don’t stress about us. We’ll wait. It’s not as if I have never been late on a project (just ask my daughter, who got her high school graduation quilt in 4th year university). It’s Friday night now – hope things did brighten up for you this afternoon, as you thought they would. Thanks for everyone’s concern. I hope people didn’t think that I had to attend a funeral or anything that dramatic. Things should be back to (more) normal now. Time to find something else to post about. Darla, you know I love ya, right? Keep on keepin’ on my friend. This too, shall pass.